Senator Bam Aquino lauds the collective efforts of President Aquino, Vice President Jejomar Binay and Foreign Affairs Secretary Albert del Rosario that led to the granting of temporary reprieve to Mary Jane Veloso. “This once again proves that if concerned government agencies work together, positive things happen,” said Sen. Bam. Aquino also expressed gratitude to the Indonesian government for granting Mary Jane a temporary reprieve, allowing her to testify against her recruiters. 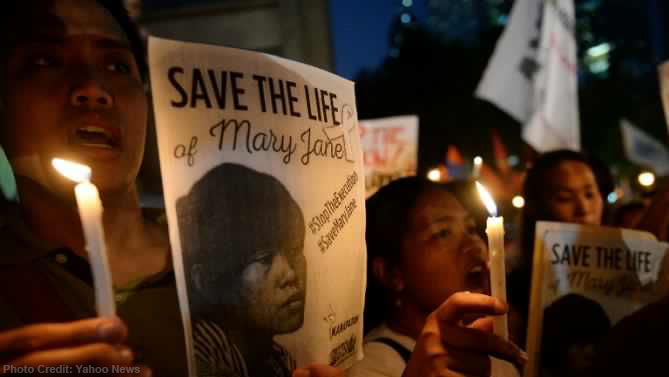 “I call on the Department of Justice and the Department of Foreign Affairs to continue supporting Mary Jane in her case so she will be spared from the death penalty,” Sen. Bam said. Indonesia has given Mary Jane a temporary reprieve to allow her to testify against her recruiter Maria Kristina Sergio, who earlier surrendered to authorities in Nueva Ecija. Sen. Bam also called on authorities to beef up the case filed against Mary Jane’s recruiters and others responsible for her plight so she can get justice for her years of incarceration and torment. “Let us exert all means necessary to protect our Overseas Filipinos against syndicates who use them as drug couriers and other illegal activities,” Sen. Bam added. Sen. Bam recently filed a resolution seeking to conduct an inquiry on the death penalty cases involving OFWs and the delay in the disposition of overseas-related cases, particularly illegal recruitment and trafficking. “We need to ensure that assistance will be provided to the 805 overseas Filipino workers (OFWs) – 45 of whom are on death row – incarcerated in different parts of the world,” asked Sen. Bam. In his Senate Resolution No. 1266, Sen. Bam revealed that around 805 OFWs face drug-related cases worldwide as of September 2014. “Most of these cases are in Asia at 341, 244 in the Middle East and Africa, 116 in the United States and 104 in Europe,” said Sen. Bam. “Around 45 OFWs are in death row, but their sentences are not yet final as the cases are on various stages of appeal,” he added. Based on data from the Department of Foreign Affairs (DFA), only 196 OFWs have received help from the department’s legal assistance fund from January 2011 to August 2012. The DFA attributed this low number to the limitation under Sections 18 and 19 of Republic Act No. 10022, which amends the Migrant Workers and Overseas Filipinos Act of 1995. “Kung itinuturing natin ang mga OFWs bilang mga bayani, kailangan natin silang bigyan ng sapat na suporta at proteksyon lalo na’t sila’y nasa ibang bansa,” emphasized Sen. Bam. “Ang laki ng kanilang kontribusyon sa ating pag-unlad. Huwag natin silang pabayaan,” added Sen. Bam. Bored ka ba? 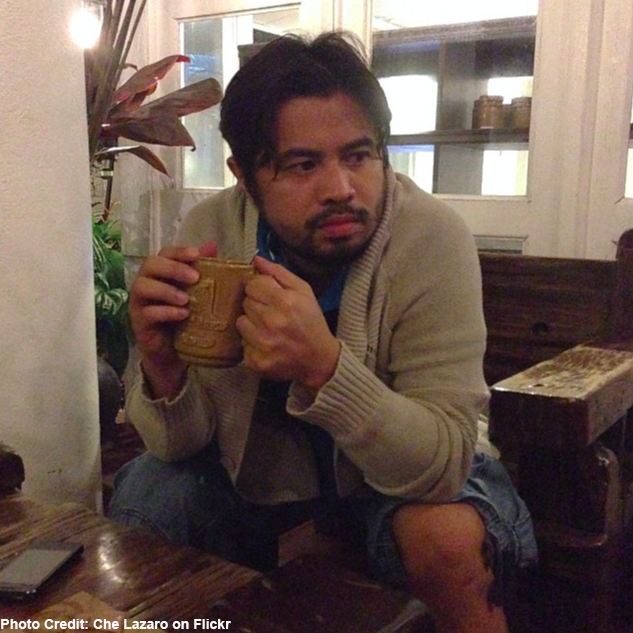 Ito ang pitong suhestiyon para maalis ang boredom mo at maging productive ang iyong summer! 1. Mag-swimming. Sa init ng panahon, masarap magbabad sa dagat. Kung walang pera o oras mag-outing, magtampisaw na lang sa inflatable pool, batya o sa drum! 2. Magpaka-sporty. Bago i-showcase ang katawan sa LaBoracay, bumisita sa boxing gym, jumoin sa volleyball league, subukang mag-Zumba, o makiuso sa mga exercise videos para ma-achieve ang inaasam na yummy body. 3. Mag-aral magluto. 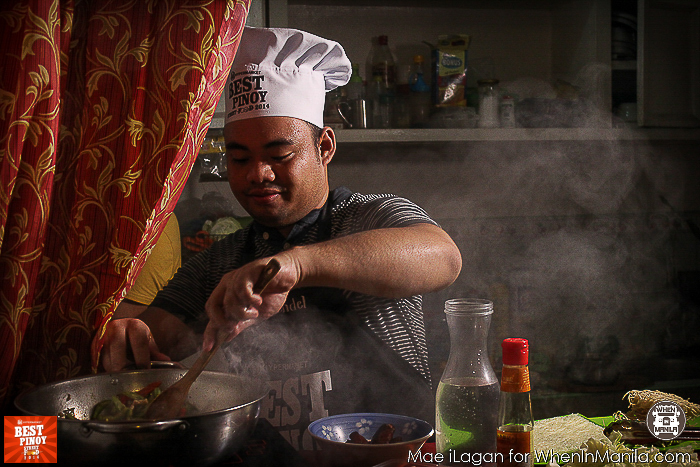 Mag-ala Chef Boy Logro ngayong summer at pagbutihin ang cooking skills. Ipatikim sa mga kaibigan at pamilya o di kaya magpasikat sa iyong crush! Ika nga nila, the best way to anybody’s heart is through his/her stomach. 4. Maging next Youtube Sensation o Online Hit gaya nina Mikey Bustos at Bogart The Explorer! Sumakay sa uso na dubsmash o kaya, maglaro ng DOTA habang walang pasok sa eskuwela. Mag-DOTA till the break of dawn, malay mo, maging next member ka ng #TeamRave. Huwag ka lang pa-offload. 5. Mag-emote ng wagas! Magbasa ng libro habang nasa coffee shop para magmukhang studious. Gumawa ng tula tungkol sa traffic sa EDSA o di kaya’y mag-blog tungkol sa iyong sawing pag-ibig. Baka maging viral pa ang iyong susulatin at gawin pa itong novela ng Precious Hearts Romance. 6. Magpakitang gilas sa pagvovolunteer for a good cause. 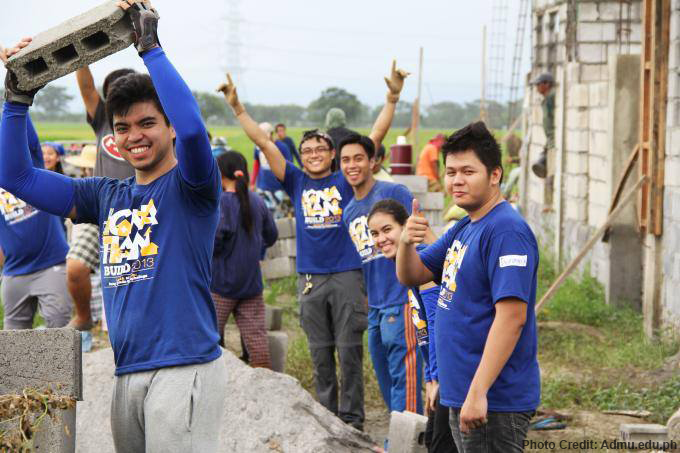 Isama ang mga barkada o gawing date ang paglilinis ng classroom sa Brigada Eskuwela o pagtatayo ng mga bahay sa GK Bayani Challenge. Nakapagpa-cute ka na, nakatulong ka pa.
7. Mag-move on at mag-let go…ng mga lumang gamit sa bahay. 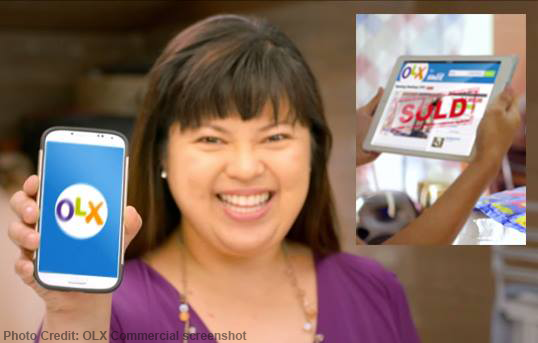 Ang mga gadget na di na nilalaro at mga t-shirt na di kasya, ibenta mo na sa OLX. Baka ito na ang simula ng hinihintay mong suwerte sa negosyo. Huwag lang ibebenta ang gamit na hindi sa iyo. Kung mayroon kang naiisip na Lis7ahan at nais maging miyembro ng ListAvengers, mag-email sa team.bamaquino@senado.ph! NOW, THEREFORE, BE IT RESOLVED, as it is hereby resolved that the Senate of the Philippines commend and honor the Filipino UN peacekeepers stationed in Golan Heights for demonstrating exemplary courage and resolve in the recent stand-off against Syrian rebels, successfully carrying out their peace keeping mission, and reflecting the professionalism and competence of the Armed Forces of the Philippines. Whereas, the automotive industry in the Philippines comprises an accumulated total of Php 120 billion in investments, principally in fifteen vehicle assembly plants, seven of which have the critical Electro-Deposition painting systems. Based on reports, the total nationwide capacity is two hundred thousand units per annum. Total projected sales for 2014 is expected to reach 250,000 units. However, locally assembled vehicles presently account for only 32% of the total supply. Whereas, existing regulations on production, importation, registration and operation of vehicles should be reviewed for relevance and efficacy. More particularly, the databanks of the various agencies should have links to the BOI that would provide accurate data on the dimensioning of the market and the industry. This would help reduce smuggling and improve the roadworthiness of the vehicles plying the streets of the country. NOW, THEREFORE, BE IT RESOLVED, as it is hereby resolved to direct the appropriate Senate Committees to conduct an inquiry, in aid of legislation, on the Philippine Automotive Industry Development Roadmap with the end view of the alignment of the industry with the infrastructure plans of the government. NOW, THEREFORE, BE IT RESOLVED, as it is hereby resolved to direct the appropriate Senate Committees to conduct an inquiry, in aid of legislation, on the impact of the enhanced inter-agency coordination mechanisms of the national government and the pro-active response of local government units and the private sector on disaster preparedness and mitigation in the country. Whereas, Nerlita Ledesma, a correspondent for the news tabloid Abante, was shot dead last 08 January 2015 in Balanga City, Bataan. If proven to be work-related, the killing of Ledesma will be the 146th case in the Philippines since 1986 of a journalist/media worker killed because of their profession. Whereas, the enforcement and the prosecutorial arm of the government should be able to effectively investigate and prosecute these senseless media killings in order to give justice to the victims and their families and put an end to impunity for crimes against journalists. NOW, THEREFORE, BE IT RESOLVED, as it is hereby resolved to direct the appropriate Senate Committees to conduct an inquiry, in aid of legislation, on the circumstances leading to the alarming increase of crimes against journalists with the end view of expediting the investigation and resolution of these cases. Whereas, there is a need to review the provisions of RA No. 776 on Violations and Penalties, where any carrier or person who violates or fails to comply with any provision of the Act, or any of the terms, conditions or limitations in a permit or amendment thereto or any orders, rules or regulations issued by the Civil Aeronautics Board shall be subject to a fine not exceeding P5, 000 for each violation. NOW, THEREFORE, BE IT RESOLVED, as it is hereby resolved to direct the appropriate Senate Committees to conduct an inquiry, in aid of legislation, on the imposition of fines and penalties by the Civil Aeronautics Board on erring airlines with the end view of amending the provisions of Republic Act No. 776 otherwise known as the Civil Aeronautics Act. Whereas, the Philippines need to improve its limited network of seaports, airports and expressways, to the detriment of transporting passengers or goods, by land, water or air. The national government should focus on the improvement and integration of major transportation infrastructures. NOW, THEREFORE, BE IT RESOLVED, as it is hereby resolved to direct the appropriate Senate Committees to conduct an inquiry, in aid of legislation, on the prioritization of transportation infrastructure projects and the efficiency of the systems management in seaports, airports, expressways and national roads with the end view of streamlining its operations to improve the services to the public. 9. P03 Rodrigo F. Acob Jr.
11. P03 Andres Vlernes Duque Jr.
21. P02 Nicky DC Naclno Jr.
NOW THEREFORE, BE IT RESOLVED, AS IT IS HEREBY RESOLVED, recommending the posthumous awarding of the Medal of Valor to the forty-four (44) PNP SAF officers who sacrificed their lives in Mamasapano, Maguindanao, in the performance of their duty and commending them for their exemplary courage and heroism. Resolved, as it is hereby resolved, To express the sense of the Senate of the Philippines to declare March 6, 2015, the 40th day after the unfortunate and bloody Mamasapano incident, as a “National Day of Healing for Unity and Peace”.